A lovely view of the Kenai Peninsula around Seward and Moose Pass Alaska. It reminds me to tour there again, like we did years ago. Here’s what I wrote about Alaska in 2004. After climbing for 6 hours, spinning into a steady headwind, on our way to Valdez, I finally understood how big Alaska is. 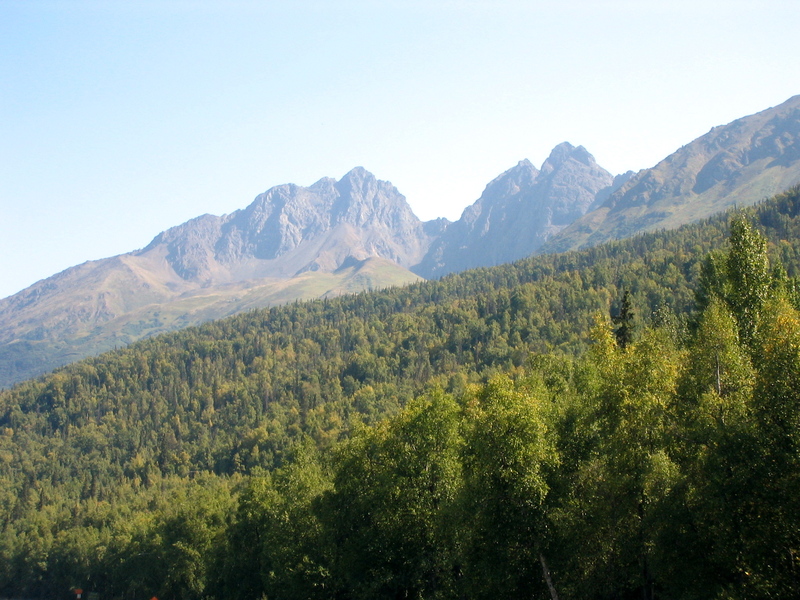 I saw it when we turned a sharp corner, descending from Thompson pass, and looked straight into the striking peaks of the Chugach National Forest. “I’m meaningless moments,” a speck in time, I was just dust floating by this grand landscape. Before we started the bike tour, I attempted to read Michener’s Alaska, I fell asleep each time, but distinctively remembered how he described Alaska, how it had been formed by tectonic plates, in the ring of fire, over millions of years. Looking up at the peaks, I tried to visualize that process, how the peaks got so high, how the glaciers formed, and how the streams flowed. Then Pam whizzed by me, grinning, rushing down the pass, challenging me to catch her and I snapped back to our ride. We had two hours to go and I needed to focus on getting us to Valdez. We got to Valdez and sat in the hot tub for hours…..